Faye Longchamp-Mantooth lives on an island. Not any island – Joyeuse Island off the Florida coast, where she has roots that go back generations. She also has a husband, Joe, and two children, Michael (age 2) and Amande (age 17). She is an archeologist and loves her work. Her world seems perfect. But it isn’t. As we enter Isolation, the 9th book in the Faye Longchamp Mystery Series by Mary Anna Evans, Faye’s world is in shambles. She’s a shell of her former self who wanders the island doing aimless mini-excavations for nothing in particular as she mourns a great loss (I don’t want to give away too much by saying more). Not only that, but her father-in-law, Sly Mantooth, is staying with her family and he and Joe have an uneasy relationship. To add to her troubles, someone up and murders her friend Liz, owner of a restaurant at the marina on the mainland. Faye may not be herself, but she’s damn sure going to look into the murder of her friend. Coming into a series at book 9 is never easy – and it isn’t easy here. Though author Evans does a reasonably good job making this a stand-alone book, it’s clear that there are a lot of things we don’t know about Faye and Joe that have been covered in previous installments. Not the least of which are the circumstances surrounding the recent tragedy. And that’s a tough one – it plays such a huge role in Faye’s emotional state throughout the book that it’s hard not knowing what happened. On the other hand, considering that this is book 9 Evans does a remarkable job of letting us into life on Joyeuse Island and all that it means to both Faye and Joe. The attachment they feel for their home – and the reasons for it – are made abundantly clear without feeling like tacked on narration. I like these characters, Faye and Joe and even Sly, with their deep appreciation of nature and history. The mystery of who killed Liz – and may well be planning harm to others on and around Joyeuse Island – is pretty good. It isn’t tremendously compelling, but it’s solid enough to keep you guessing. The peripheral characters that populate the rest of the story are a little bit bland, but I prefer that to the off the hook wackos that most cozy heroines put up with. The other real selling point to this series is Faye’s connection with her heritage on the island. Through journals that she alone possesses, she knows a lot about Cally Stanton. Born a slave, she eventually ran the household on Joyeuse and was Faye’s great-great-grandmother. Protecting her secrets, her story and her legacy is something Faye holds dear. It appears that Evans rolls out her history a little at a time as the series progresses. Overall, I like the characters, the main setting of Joyeuse Island with its many secrets, and the relationship of Faye and Joe (and their family). 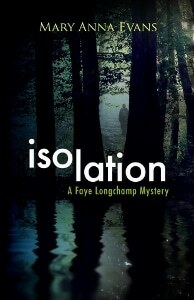 Isolation is a good book, marred only for me by not having read previous installments in the series. Though it isn’t a bad stand-alone, I recommend reading the series from the beginning. 3 stars out of 5.